This operation involves the removal of the gallbladder and often an x-ray of the bile duct system to ensure no gallstones remain. The operation is usually performed laparoscopically but for many reasons an open procedure may be necessary. 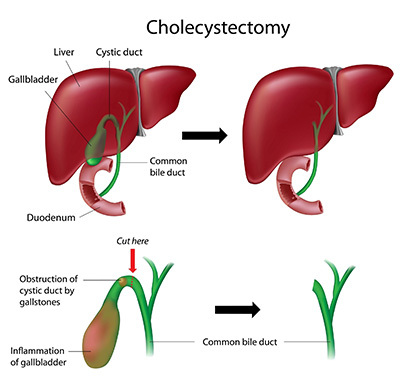 The gallbladder is freed from its attachments on the underside of the liver after the cystic duct and artery have been safely divided. The gall bladder is removed through a port at the umbilicus.